A group of youth from Oxford House First Nation recently dropped a rap song on YouTube that sheds light on the challenges of living in a remote northern community. "I really wanted to show what it's like to live in a place like that, just so people can understand more the struggles that First Nations people go through," said Carlene Weenusk, who lent her pipes to the track. 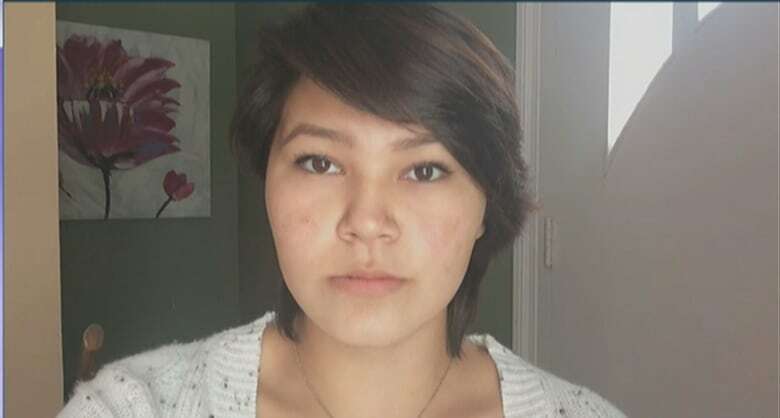 The 16-year-old is from Oxford House but now hails from Thompson, about 186 kilometres northwest of the First Nation. Weenusk said back home, there aren't many creative outlets or other opportunities for youth to immerse themselves in. "The schooling is really bad. We are far behind," she said. The song, titled "When the dust settles," came to Weenusk and her friends after hearing Oxford House described that way in conversation with David Hodges. Hodges is the director of N'we Jinan, the company that produced the video with the Cree youth. "When we first arrived, myself and André, the filmmaker, we saw so much dust in the community. It's all dirt road. There is dust in the building, in the school," Hodges said. "With the kids, we started talking about metaphors that are attached to dust. We basically came up with that expression 'When the dust settles': You know, when things are really, really hard and challenging, sometimes we don't see the world the way we should really see it. "The kids wanted to bring that message of hope because they know there is a lot of struggle in that community. They wanted to say that when the dust settles, there is hope, you still have your people there." Weenusk said in the past couple of weeks since the song was uploaded online, she's received a lot of positive feedback. "The reaction we have been getting from is really amazing," she said. "People thanking us for the video and writing about what it's like to live in a community like that, that people feel the same way." In Thompson, Weenusk is focusing on school. She wants to go on to attend the University of Manitoba and pursue a degree in dentistry before heading back to Oxford House. Why dentistry? "We don't have a permanent dentist there. I want to help down there," Weenusk said. "I want to show them that there is more out there than a small town without opportunities. It can give them hope to get out and to do better for themselves. Hodges added that giving the youth a platform to voice their feelings is about empowering them and inspiring change in and beyond Oxford House. "A lot of young kids [kill themselves] because they feel they are not being heard. Nobody cares about what they say. A lot of kids love rapping. They are not allowed to do it in the community because the community responds more to gospel and worship music," Hodges said, adding the response to the video is a positive sign. "If the kids feel they can't express themselves, it puts them in a category where they feel no one cares about them. It shows that people care because the community wants us to help them." Oxford House First Nation is about 580 kilometres northeast of Winnipeg.